Get all the action with depth and clarity in Ultra High Definition 4K Resolution Action Pro Camera. This little wonder is waterproof , shockproof and dustproof records all your action and lets you view it live on your cell phone thru a free app for Apple or Android phones. So many features that you will have to take several vacations to use them all fully. Just to mention few of the features like Photo Shoot Video Shoot Burst Photo Shoot WiFi Mode connect to the iOS App or Android App download free and watch your action Live on your phone. Time Lapse Video Looping Video Shoot in 1080p mode 100 ft under water waterproof. Live Action View on Cellphone RF remote (with replacable battery) up to 50 ft Multiple Mounts and accessory included. ( see photo) Rechargeable Battery HDMI port connect to TV or Monitor to view. Less than 6 oz wt. 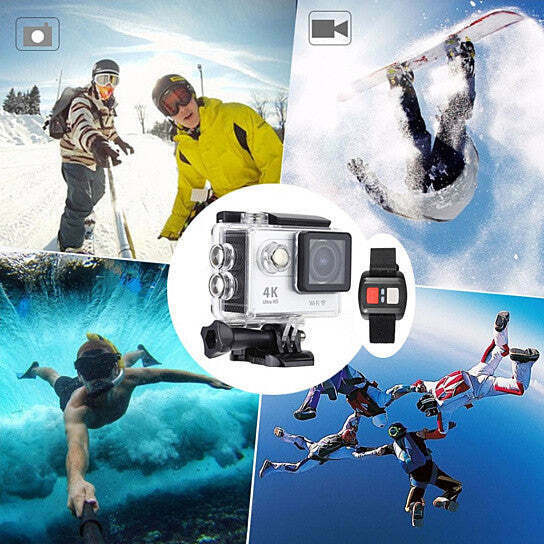 16 Mega Pixel Camera 170 Deg Wideangle Lens Built-in Gyro stabilizer In-body sensor stabilization Electronic image stabilization will greatly reduce camera shake and vibration in order to get the perfect shot every single time. Record high quality and stable video at 4K 3840*2160 30fps and 1080p@60fps to capture the most memorable moments for you.